Ever been to Boston? Have ANY interest in American History? The two literally came alive today. After a terrific breakfast at a local restaurant called, Sound Bites, we headed into downtown to walk the ‘Freedom Trail’. Being lovers of history always provides an interesting back drop for trips like this. A little over a year ago, Brian went to visit daughter #2 and insisted on driving south to the spot where the Pilgrims came to the New World. . .Plymouth Rock. While there’s no rock any longer, just being in the same spot gives a sense of purpose and belonging through history. Today’s walking—and we mean serious walking—included King’s Chapel, Faneuil Hall, the Old North Church, the grave sites of Samuel Adams, John Hancock and Ben Franklin’s parents. . .along with Generals and Commanders from the Continental Army who died either during the American Revolution or shortly thereafter. . .markers that have been in the ground for 300 + years. History was a great way to start the day; we also had to make a visit to the home of ‘Cheers’…where everybody knows your name! A final stop and we headed back to drop the girls off at their place and we headed back into downtown for some sunset viewing. So, tonight was the rising of the ‘Super Moon’ and with an early moonrise, we headed for the shoreline around Quincy, MA…we pulled over at a roadside beach where we had previously stopped and found a perfect place to watch the sun go down and the moon come up. Because it was such a beautiful day…there was a bit of haze on the horizon so it was almost an hour after sunset when we finally spotted, ‘Super Moon’ up in the sky. It wasn’t quite as magnificent as had been promised, but because of the beautiful sunset, the orange glow on the moon was spectacular! We’ll try again tomorrow night, but today was a full day…that was full of fun, laughs, history and lots of people! 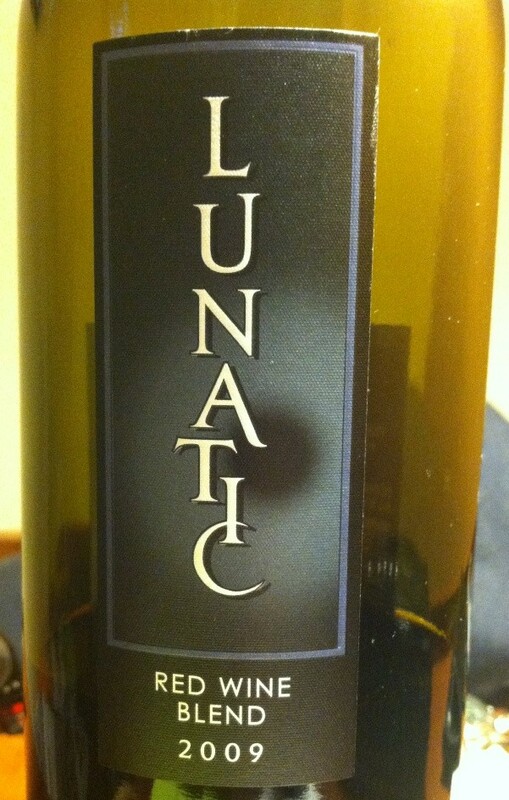 Appropriately, we found a bottle of wine, a 2009 Lunatic! The 2009 Lunatic Red has richness and complexity, owing to the fact that potent components are blended to magnify their individual contribution. We tasted the cocoa and cassis of barre- aged Cabernet, bright raspberry and pomegranate fruit of Sangiovese, the warm ‘Amarone’ and peppery spice of Zinfandel and the firm grip of Souzao’s tannins. You will taste the unexpected. The blend is 39% Sangiovese, 38% Cabernet Sauvignon, 14% Zinfandel, 9% Souzao–we think it’s an amazing combination of flavors and for a price that shocked us…less than $15 a bottle! It’s yet another case of trying a different wine and finding a gem for a fair price. We think that this is a wine that can taste good now and a year from now. We’re aren’t as sure about newer vintages, but this 2009 is a really nice surprise—one that we’d like to buy again. Good wine combined with a bit of a history lesson and a beautiful day. . .tough to beat. Seeing some of our country’s greatest Patriot’s final resting places—PRICELESS. If you’ve ever cared about American History, then it’s time you hopped a plane to Boston, there’s more to this town than meets the eye, but the history is amazing. Whether you’re a history buff or not, enjoy your favorite wine responsibly and remember to recycle whenever possible. Categories: Uncategorized | Tags: Ben Franklin's parents, Boston, Freedom Trail, John Hancock, Lunatic Red, MA, Old North Church, Quincy, Samuel Adams, Sound Bites | Permalink.